As you may have heard, Apple has refreshed its Apple iPod line for the second consecutive September. - See my updated Portable Media Players Gallery for details on each of the new products, with comparisons to previous generations and competitive products. What's particularly fun about tracking the iPod line is the way it exemplifies the tremendous and continued price drop for storage -- combined with substantial upgrades in capabilities (music to photos to video, 1" to 3.5" displays, mono to color). - See my updated Apple iPod Pricing tables to track the increased capabilities Apple has been able to offer at different price points -- $79/$99 shuffle entry point, $149 and $199 nano with display, $249 and $349 iPods with hard drive. The new Adobe Creative Suite 3, now available on Windows and Macintosh, includes the CS3 Production Premium suite of video tools -- with After Effects, Premiere Pro, Encore for DVD, plus the new Soundbooth for audio (replacing Audition in the suite), plus the new tools from Serious Magic: OnLocation for video monitoring and recording. and Ultra for video keying. - See the updated Adobe Creative Suite 3: Applications, Suites, New Features article for details on the suites and Production video applications. Besides audio recording, editing, and enhancement, Adobe Soundbooth includes a new AutoComposer feature to create customized music using customizable Soundbooth Scores, adjusting the length, mood, and instrumentation to match your production. You can use the Adobe-provided scores, or now create your own scores -- Adobe has just released the Soundbooth AutoComposer Toolkit with tools and documentation for content developers to create their own Soundbooth Scores for use with the Soundbooth AutoComposer feature. - See Adobe Soundbooth: Audio for Video for an overview of this new sound tool for video editors. Meanwhile, Adobe Audition continues as an independent high-end audio editing tool on a separate development schedule. The new Audition 3 also was just announced, and is due before the end of the year. It provides improved multitrack editing, new effects, enhanced noise reduction and phase correction tools, and VSTi virtual instrument support. You can now edit in the amazing spectral frequency mode with paintbrush selection and healing brush. - See Hart Shafer's Adobe Audition blog for more information. See the Video Editing Software Gallery and DVD Authoring Software Gallery for information and links to editing and authoring tools. Only a few years ago, we were struggling with configuring desktop systems to support editing DV video, with its then-huge demands for real-time video capture, streaming to hard disk, and video-rate decompression and processing. Today, even mainstream consumer systems don't break a sweat for editing standard-definition video. But we've also moved on -- and now we're back demanding more with the step up to high-def video. While high-end consumer systems can handle advanced SD editing and some HD work, if you're getting serious about HD video (and DVD and animation), you should think about moving up to a workstation-class system that takes advantage of the latest technology, including multi-core processors, fast PCI Express interfaces, DDR2 SDRAM FBD memory, and SATA hard drives. So what kind of system should you be looking at to edit HD video, and what are the best cost / performance trade-offs in today's market? We'll take a look at the recommendations from video editing software vendors including Adobe, Avid, and Apple. And we'll step through configuring two representative workstations -- the Apple Mac Pro and Dell Precision workstation -- including base configurations, processor, memory, storage, hard disk, and graphics / display. You can check out the basic system requirements for your preferred video editing software, and use the recommended system configurations as a starting point. Then tweak the configuration to fit your needs, allocating your budget to bulk up key components like the processor, memory, and hard disk to fit both your current plans and to give headroom for the future. So pull the trigger on the purchase and step up to the full-powered system you really need. Of course prices will drop the next day, and a new product line will be announced the next week, and totally new technology will appear in the next month -- but meanwhile you can be effective and productive on your new video editing workstation. See full article: High-Performance Systems for High-Def Editing. See PC Technology Resources for a glossary and references for PC system and peripheral technology. The good news is that high-def video is now accessible to consumers -- with sub-$1000 camcorders, today's computer power, and now $100-range consumer video editing software. The new AVCHD consumer video format promises better compression than HDV, especially for camcorders recording to DVD disc and memory cards. But just as with the adoption of previous new formats -- DV to MPEG-2 to MPEG-4 -- the software applications need time to catch up. Not too surprisingly, I found varying support of AVCHD when I tested the current versions of today's consumer video editing tools. As a result, before you dive in to the new formats, you'll need to experiment before you settle on the right approach for your specific camcorder or collection of clips. The applications varied wildly in their handling of these formats: importing HDV and/or AVCHD; capturing from a camcorder over USB/Firewire and/or importing directly from files; importing individual sub-clips and/or the entire folder of shots; recognizing the file formats or requiring them to manually selected; and importing the files directly or needing them to be renamed (i.e., to .MPG). The applications also varied wildly in their ability to process the formats in real-time: some allowed me to drag the slider and instantly scan back and forth in the clip, while others delayed for seconds when jumping to a new point in the clip, even when paused. However, because these formats do require a bulked-up system, some of the applications are twitchy about running on possibly underpowered systems. For example, Pinnacle Studio displayed a warning on my ultraportable notebook, but then did its best to play the videos as well as it could. On the other hand, CyberLink PowerDVD flat-out refuses to run if it decides it does not like your system -- in my case rejecting a new quad-core workstation until I had downloaded an updated display driver. Other applications played and edited AVCHD fine on this system, but PowerDVD apparently was hard-coded to require only specific configurations. Memory cards are the future for camcorders. Yes, this is obvious in a theoretical way, but after finishing the summer on a vacation trip with the Panasonic HDC-SD1 AVCHD camcorder that records high-def video to SD memory cards, I'm really convinced in a much more visceral way. Just look at these devices (like this Panasonic HDC-SD5), now available from companies including JVC, Panasonic, Samsung, and Sony. They're basically the size of a soda can -- a big lens, with a flip-out display on the side and some electronics and slots on the back for the battery and memory card. They're just so easy to carry and easy to use. Using memory cards allows these cams to be smaller and more rugged, with no mechanical parts for tape transport or disk drives. All the delays of tape are gone, of course -- rewinding and searching for clips is replaced with thumbnails of each clip and instant playback and recording. And memory cards provide removable storage, unlike hard disk camcorders which require off-loading to a computer when the disk fills up. But how can today's 4 or 8 GB SD cards compare to a camcorder with much larger 30 or 60 GB hard disk, which can record 5 to 7 hours of standard-def video or 5 hours of full HD video? Actually, SD cards work just fine -- you now can fit an hour or more of video on an affordable SD card, so you can carry multiple hours of removable storage in the space previously used by one DV tape cassette. You can get a 4 GB SDHC card for around $50, and 8 GB SDHC cards are available from companies like Kingston and SanDisk for under $100. So I traveled with the Panasonic HDC-SD1 high-def camcorder, which records AVCHD video at 1440x1080 resolution, along with Dolby Digital AC3 5.1 channel audio (yes, there are 5 mics on the top of the unit). I also had a brief hands-on with the newer HDC-SD5, which bumps the video resolution to full HD, 1920x1080, but with stereo audio. Both are available for under $1000. As discussed in my previous post on working with AVCHD video, Pinnacle Studio 11 provides great support for editing high-def video. You can browse, preview, and import HD clips, mix high-def and standard-def formats edited together on the timeline with no fuss, and then export to a profusion of formats. Studio 11 features a more scalable user interface, a new Scorefitter music generation tool to automatically create soundtracks to match the length and mood of a video, and simplified Web publishing to Yahoo! Video for public viewing or to the new Pinnacle StudioOnline.com private viewing service. Studio is actually available in three versions. - Studio 11 Plus adds advanced editing and effects, especially for high-def video with native HDV and AVCHD editing ($99). - Studio 11 Ultimate bundles add-in tools for lighting and film effects, panning and zooming, and audio cleaning -- plus a green screen backdrop for shooting chroma key effects ($129). SanDisk is comfortly settled in as the second largest seller of MP3 players in the United States, with a broad product line of flash-based Sansa media players. For music (plus display and FM radio), there's the Sansa Clip music player, fun Shaker with speaker and dual headphone jacks, and small-screen Express and c100 players. Then for video and photo playback, the Sansa e200 adds a 1.8" color LCD. and at the CES conference in January, SanDisk pre-announced a new Sansa View product, with a 4” widescreen color display and integrated speaker. Now SanDisk has retooled the product, and recently announced the redesigned Sansa View, to be available next month. The new View has the same form factor as the e200 line, but a larger 2.4" color screen at 320x240 resolution. The View includes FM radio and voice recording, plus a MicroSD/SDHC expansion slot for up to 8 GB of additional storage. It supports MP3, WMA (with DRM), and WAV audio; MPEG-4, H.264, and WMV video, and JPEG photos. The View is priced at $149 for 8 GB of storage, $199 for 16 GB. See my Portable Media Players Gallery for details on these products, with comparisons to previous generations and competitive products. DVD was originally designed as a write-only delivery format, with the video and audio and menus all glommed together into obscure VIDEO_TS folders and humongous VOB files. But these days DVDs are just another video format, and many video editing and DVD authoring tools can easily crack open an (unprotected) disc and extract chunks of content. But if you mess with DVDs a lot, or want more precise control over the exact segments that you extract, or need to extract to specific formats in the full original quality, then check out Miraizon Cinematize -- a dedicated tool for DVD clip extraction and conversion. - The base Cinematize 2 extracts DVD video and audio to QuickTime codec, which can then be imported by common video tools for editing, download to portable devices, or uploading for Web sharing ($69 box / $59 download). - Cinematize 2 Pro, announced this month, adds advanced features including menu and subtitle extraction, batch extraction, multi-channel audio extraction, and custom QuickTime compression options ($149 box / $129 download). See my Video Editing Software Gallery under Video Processing Software for details on these and related products. Sony Creative Software has released the latest version of its professional video, audio, and DVD creation tool, Sony Vegas Pro 8. As in previous versions, the Vegas Pro product is actually a suite of products: the Vegas Pro 8 editor, DVD Architect Pro 4.5, and Dolby Digital AC-3 encoding software. Vegas is designed to provide an integrated environment for all phases of professional video, audio, DVD, and broadcast production -- to process DV, AVCHD, HDV, SD/HD-SDI, and XDCAM formats in real time, fine-tune audio with precision, and author surround sound, dual-layer DVDs. New features include 32-bit floating point video processing, multicamera editing, and ProType titling. There's also additional HD editing support with Sony AVCHD workflow and Blu-ray Disc burning. See my Video Editing Software Gallery for details on this and related products. 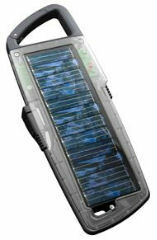 Better Energy Systems is expanding its line of Solio Hybrid / Solar Chargers. These combine a high efficiency solar panel with a large capacity integrated battery -- so you can leave the panel charging in your room, and then top off your portable devices when you return. The Solio Classic ($99) unfolds with three panels, and includes a suction cup to attach to a window. The battery is 3.6 volts, 1600 mAh -- A fully charged unit is rated to recharge a typical mobile phone up to two times, or deliver up to 15 hours of MP3 music. The Solio Hybrid 1000 ($79, due next month) is designed for more rugged use, with a carabiner-clip handle. 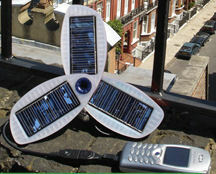 The battery is 3.7 volts, 1000 mAh -- A fully charged unit recharges a mobile phone once, or delivers 10 hours of music. Have you noticed Samsung lately? It has expanded from its core technologies including memory and displays into a major presence in the computer and consumer electronics businesses, including mobile phones, televisions, media players, cameras and camcorders, computers and peripherals, and even home appliances. For example, the Samsung YP-U3 is a stick music player with 2 GB for under $89. It's available in some uncommon pastel-ish colors, white, black, blue, green, and pink. The U3 is small and light at 3.44 x 0.96 x 0.5 inches, 0.8 ounces, and includes a voice recorder and FM tuner. The bottom end has a built-in slide-out USB connector, so you don't need a separate or special cable to connect to a computer or recharge. The U3 is designed with no exposed buttons for the playback controls -- you just press on the smooth surface of the front of the player where the controls are marked. The end cap flashes to acknowledge button presses, and to show the player is still active even after it dims the display. As you use the controls, the 4-line blue OLED has enough room to navigate the menus and display song names and playback status. The main menu has a nice animation as you switch modes -- the icons for Music, FM Radio, Voice Record, Settings, and Now Playing are made with blue dots, which morph from one shape to the next. The Samsung YP-K3 has a similar design sense, as a slim and elegant player with 2 GB for $119, and 4 GB for under $169. The player is framed in silver around the edges, with the rich colors on front and back: black, red, and green. The K3 has a 1.8" color OLED display, and measures 3.78 x 1.73 x 0.27 inches, 0.76 ounces. It plays music and photos (including slideshows), has an FM radio, but no mic for voice recording. The K3 has only one exposed button -- power/hold on the side. The playback and navigation controls appear when the smooth touch pad on the bottom face lights up. The interface has a similar animated feel to the U3, with more detail and subtle animation. The frequency display for the FM radio is particularly elegant, with a subtle drop shadow under the numbers. And these are just the beginning -- Samsung is now releasing the T10, like the K3 but upgraded to add video playback (and available in purple! ), and the P2, upgraded to a 3 inch widescreen display, which is also a touch-screen interface with finger gestures. - See the Portable Media Players Gallery for details and comparisons. A nicer solution is to have a single portable power source -- i.e., carry one larger battery, with the ability to charge up whatever devices that end up needing a boost. As summarized in my Portable Power Accessories Gallery, there are a bunch of options along these lines, ranging from AA batteries with adapter tips (Energizer Energi To Go, Turbo Charge) to complete systems of large chargers/batteries with adapters and tips (iGo, MFUEL). And now there are some new options in between -- more than a little power, but also not a huge brick of a battery to carry around. The U.N.O. Instant ChargeNgo Portable Battery Charger is the size of a few AA batteries at 1.6 ounces, but it's a fixed rechargeable Li-ion battery that holds more power compared to AA alkaline batteries. Recharge it from wall power (it fully charges in 3 1/2 hours). Then use the interchangeable adapters to charge your specific device on the go (including USB adapters for devices including MP3 players and Bluetooth headsets). The Instant ChargeNgo is rated to charge completely depleted mobile phones in 90 minutes to 2 1/2 hours, or provide 50 hours of continuous play for MP3 players and iPods. It's also designed to allow charging devices directly when the A/C charger is plugged in, but I could not get this to work with several devices. It's priced at $39.99, and adapters around $8.99. 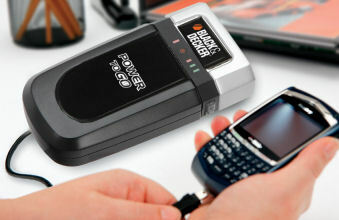 For more power, try the line of Black and Decker Power to Go Cordless AC/USB Power Supplies. These plug in to the wall to charge (for some 10 to 15 hours), and then offer both an A/C plug and USB jack for charging your electronic devices. Just plug in the USB cable or AC adapter that came with your device, and charge away. The Power to Go line includes a smaller Compact 0.6 pound / 8 W unit for around $51 that provides up to 1 hour of extended runtime (estimated for typical mobile phones), a midsize 1 pound / 16-20W unit ($69) for 4 hours of runtime, and a larger 2 pound Laptop / 80-100W model ($99) for up to 9 hours of runtime. These could provide the just-in-case boost you might need for your devices, without having to carry all the cables and adapters for all your devices. See more in the Portable Power Accessories Gallery, under Portable Battery Chargers. Have you ever been trapped on an endless journey -- the eternally-delayed airplane flight, or the bus ride to forever? Your only solace is to lose yourself in your favorite music from your portable player -- but then the batteries start running dry! Your nightmare can be over with the Inflight Power Recharger Cable -- which actually generates power from the standard audio jack on passenger seats in planes, trains, and buses. The Inflight Power Cable converts the audio signal into USB power, so it works with devices including cell phones, smart phones, music players, and game players using existing USB charging cables. The unit charges in cycles, trickle charging for 3 to 5 minutes, and then outputting power to the attached device. You also can insert 2 AA batteries to provide additional continuous power. The charger works best with strong audio signal -- loud music, at full volume. Inflight would like to see airlines provide a dedicated "Charging Tone" signal, and provides a sample clip that you can download to test with -- to charge your iPod from itself by playing the 500HzPowerTone clip. 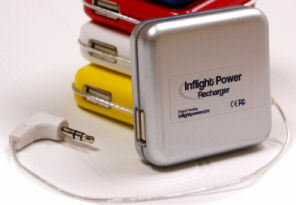 The Inflight USB Power Unit is priced at $34.99, and is also available with adapter tips for iPod/iPhone or Blackberry ($44.95), and iPod plus USB mini B ($49.99, i.e., for many small MP3 players and Bluetooth headsets). You also can get USB adapter tips for a wide range of other devices from the MDI SynCh line -- see previous post on the USB Power Adapters - MDI Syncharger. See more in the Portable Power Accessories Gallery, under Portable Power Adapters. Entries posted to Manifest Tech Blog in September 2007, listed from oldest to newest.